Chesterfield slipped to a disappointing defeat, Jay O’Shea equalising an early Coventry goal from Marcus Tudgay before second half efforts from sub Sanmi Odelusi and Frank Nouble put the Sky Bkues clear. Gboly Ariyibi pulled one back on 85 to give the hosts hope but they couldn’t find a late leveller. Byron Harrison was absent from the bench due to a family bereavement which allowed Michael Onovwigun to return to the squad, meaning the bench was somewhat short of attacking options. Chesterfield's Sam Clucas is blocked by a coventry defender. Photo: James Williamson. Stokes had to defend well to prevent Clucas getting into a good position as the game started with Spireites dominating possession with City standing off. Pennington nicked the ball off Roberts’ toe after a decent Lavery cross in. City’s first venture upfield saw Barton loop in a cross from the right for MARCUS TUDGAY, the former Owl, to place a header beyond Lee’s outstretched left hand in the ninth minute. 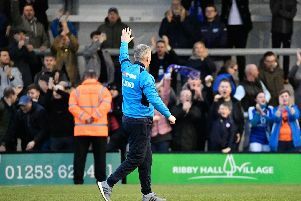 Burge stooped low to gather a Lavery shot as Spireites sought to get back on track. The keeper then made a hash of a Lavery 20 yarder but the ball, after slipping under his body, drifted inches wide of the upright, Banks over-hit the resulting corner. Lavery got round the back but a fine Martin tackle conceded a corner, Banks hit a little too hard again. Evatt was the target from Banks’ free-kick after Jones was fouled, but Coventry cleared for a corner, taken short this time, but the ball failed to make the penalty area. Pennington headed O’Shea’s cross for another corner, all for have been on the right and all have come to nothing. Darikwa hooked away a Samuel cross for City’s first corner, Barton’s shot was headed over for a second corner by Banks, Lee flapped and Jones headed out for another left sided corner which Lee caught under no pressure. The corner count increased when O’Shea’s free kick was headed out and Evatt’s looping header was held on the line by Burge. Roberts volleyed Lavery’s cross into Willis for another corner, Spireites first from the left, but a foul in the box presented play back to the visitors. Chesterfield equalised on 42 when JAY O’SHEA received 25 yards out, he turned well and hit from just outside the box, not his cleanest hit ever, but a slight deflection took the ball beyond Burge for the leveller. Lavery’s shot earned another corner, another wasted one, the final attacking action of the first half. Humphreys replaced Jones for the start of the second half. Clucas moved to left back with the sub moving to holding midfield and Banks moving further forwards. Spireites’ corner count increased to eight 45 seconds after the restart, but there was no increase in quality and again the danger from the set play was none existent. A great 50 yard run from Nouble down the left earned City a corner that ended with a simple catch by Lee. Lavery robbed Martin and his angle shot was palmed away by Burge for another corner, Hird headed goalwards but his effort was blocked and cleared. Odelusi replaced Samuel on 58 meaning Nouble moved further forwards. Banks’ cross was gathered by Burge as Spireites continued to see much more of the ball than the visitors. Ryan hit a 25 yarder from space but Burge had no problems in gathering it. Nouble cleared Banks’ free-kick. City re-took the lead on 65 when Coventry born Evatt hit a poor clearance, Barton took charge and cut the ball back for sub SANMI ODELUSI to steer the ball home from six yards in front of the 1164 visiting fans. Another home corner was cleared as Paul Cook looked to make changes. Fleck was tackled by Humphreys and a corner was earned, Lee caught from Ward’s delivery. Spireites 11th corner was another shocker. Ariyibi came on for Banks. Lee held a Stokes shot as City gained confidence from their second goal. Two decent Clucas crosses caused problems but were dealt with. Ariyibi whipped in a shot that was deflected for a throw that saw Evatt’s header saved by Burge, diving to his left. Roberts and Humphreys were on different wave lengths on the halfway line and their combined mishap allowed FRANK NOUBLE to sprint in on Lee and slip the ball beyond the keeper on 75. Roberts slipped Lavery in and his snapshot was well held by Burge and the keeper was positive gathering an Ariyibi cross. Evatt headed a corner just over as the game entered the final ten minutes. Lavery won corner No. 13, 14 followed immediately and Burge was well positioned to save from Lavery’s header. Dieseruvwe came on for Evatt as Spireites threw caution to the wind. On 85 GBOLY ARIYIBI scored his first senior goal, a well positioned angled shot from the right edge of the six. Barton had the ball in the net for City but his effort was offside. Dieseruvwe headed just wide from Ariyibi’s cross. Burge made the save of the game to deny Lavery after Humphrey’s throw. Chesterfield: Lee, Darikwa, Evatt, Hird, Jones, Morsy, Banks, O’Shea, Roberts, Clucas, Lavery. Subs: Chapman, Raglan, Carter, Humphreys, Dieseruvwe, Ariyibi, Onovwigun. Coventry: Burge, Willis, Pennington, Barton, Stokes, Ward, Fleck, Nouble, Martin, Samuel, Tudgay. Subs: Charles-Cook, Webster, Thomas, Jackson, Odelusi, Turgott, Finch.